The greens are so fast, it takes a lot of practice to get used to them. 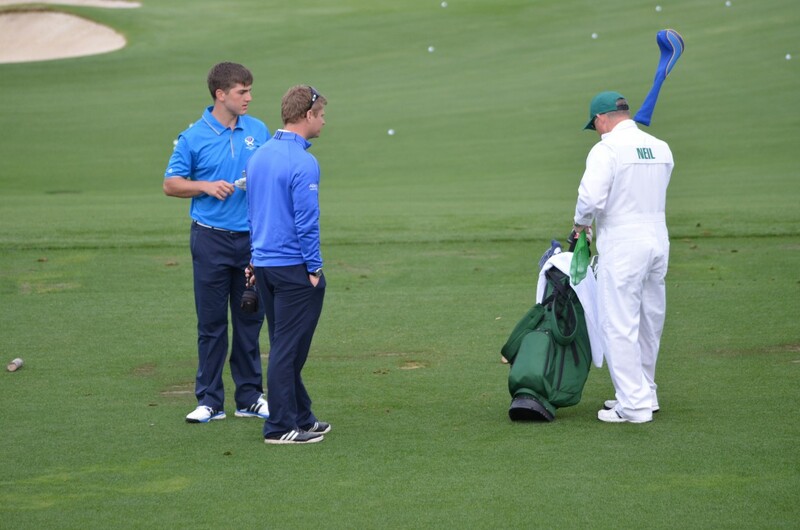 We worked on medium range putting with some drills and games several times over. 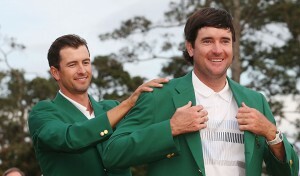 This year’s Masters was a feast of golf with birdies galore and the emergence of a truly great first time winner in Jordan Spieth to clinch the coveted green jacket. 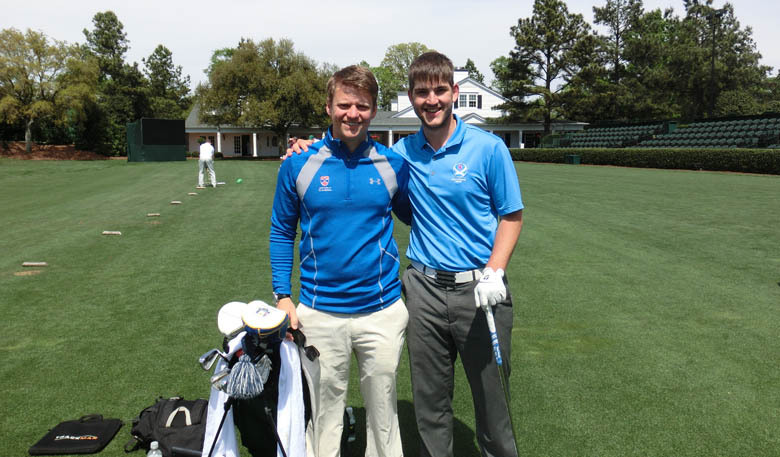 It was a first of different sorts for St Andrews Links Golf Academy Senior Instructor, who made the journey to Augusta with Amateur Champion Bradley Neil. 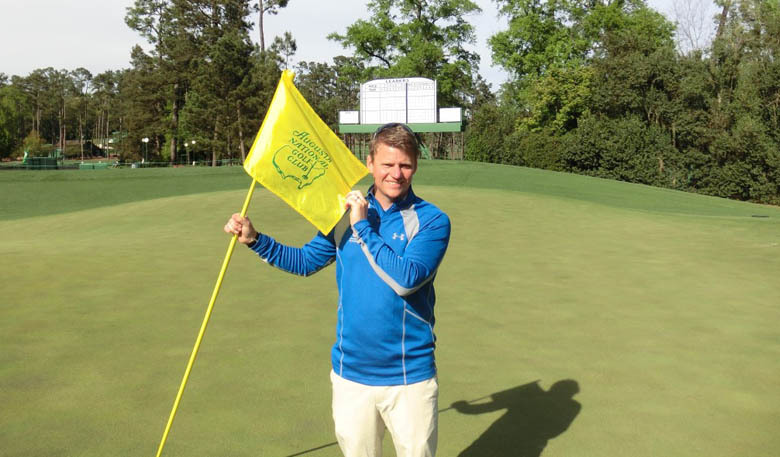 Here Kevin recalls his first impressions upon arriving at Augusta, working with Bradley during one of the biggest weeks of his career so far, and how he found the whole Augusta National experience. We drove along the Washington road which is a busy main road. There’s just a small entrance you see from the road, a right turn and we had arrived at the gate to be greeted by a very official security guard. They were very welcoming but I think it helped arriving with a player taking part! Nonetheless we were all ID checked and in we went. The drive down Magnolia Lane was impressive and certainly a special moment for me, and any golfer who ever gets to make it. It was obvious from those first few moments that Augusta National is a place of pure perfection. Nothing is out of place, from the drive, to the gardening area to the greens everything is just immaculate. Security is very tight and as a coach it can be difficult to get around. You can’t go anywhere without your player and you don’t get access to a lot of the type of areas you’d normally expect to be able to roam around to wait for your player. When you arrive at the practice range it’s not your average driving range! A huge, sprawling practice range is laid out ready for you and the quality of the turf is almost putting green quality. The targets are excellent. You have perfect little greens to aim for along with two exact replica holes to channel your driver down the fairway. The right side of the range matches the 1st hole and the left side matches the 5th fairway. Complementing this are two large pitching and chipping greens along with a large putting green. Exactly the same quality and speed of the golf course greens. Just a phenomenal facility. There was lots of work to do when I arrived the Saturday before the Masters was due to start. Bradley was not quite at his best so we had to work quite hard to regain his usual draw, which is exactly what you need to play well round Augusta. We worked for a couple of hours each day to improve Bradley’s takeaway and downswing position to create a consistent high draw. Putting was clearly going to be an essential part to a good score, we spent some time working on both putting and short game shots, specifically working on a higher spinning pitch shot and controlling speed on the greens. The greens are so fast, it takes a lot of practice to get used to them. We worked on medium range putting with some drills and games several times over. The first few tries Bradley managed to control the speed quite well but missed every putt on the low side, such is the severity of the slopes and speed of the greens. Wow. There’s no other way I can say it. Immaculate in appearance is an absolute given here. Fairways and semi-rough, all surrounded by the beautiful trees with the famous pine needles underneath. The great thing about the course is there is often only one bunker on the fairway, but it’s exactly where you would want to drive the ball. You have to hit a driver and you have to split the fairway or you will find it difficult to make even a par. The thing that you will realise is that the golf course is really hilly, tight from the tee and the greens are very tricky. All the greens are in sections and the flat sections in the corners is where Augusta place the flag positions for tournament days. There are some pin positions that you simply can’t play safe to. You have to go for it and if you miss, then you are probably making a bogey. Some of the sections are 6×6 yards to when you have 180 yards to the flag it’s a tall order for even the best golfers on the planet. 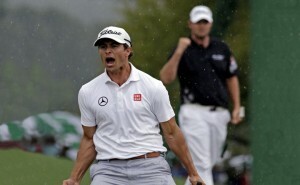 Overall Augusta is a great test of golf, once you find the fairway then you have a chance at going for birdie. But anything less than a dart like accurate iron shot and you are struggling for par.